So we've established that I like summer and autumn. Not so wild about the time of dying back, everything croaking. So I'm going to talk about what I like. What I like is poblanos on the plant. Not storebought. I bought a single poblano plant, potted, for $6.95 this spring, just on a lark, and I bet I've gotten $60 worth of those exquisite big peppers off it this season. The plant is waist-high and about 5' across now. What a deal! Oh, how I hate to see it die. But I've saved its seeds...for it is a champion among pepper plants. The peppers are fairly hot when eaten raw, but they mellow out nicely when cooked, and add a distinct flavor and bite to everything. And I put them in almost everything. Sometimes I put too many of them in. Then everyone turns up their nose. I gamely eat it all. Overkill, Poblano style. Each one the size of your hand! There's a fine harvest of sweet snack peppers and fat firm tomatillos this year, too. YUM. From utter ignorance, I am now the world's biggest tomatillo fan. Who knew? Like little citrusy green tomatoes in paper husks. So tasty. They cook so well, and add special flavor to everything. Only two of my six plants made it. Will definitely grow more next year. I throw them in all my soups, chilis, quiches, vegetable medleys, stir fries and lately on homemade pizza and sliced thin over salad. Tangily, citrusly delicious! Tomatillos are in the nightshade family, like tomatoes and eggplant. They're somewhere in between the two--pulpy, a little crispy, with a fresh tangy green tomato taste that adds so much, especially when cooked. Out of this world when sliced thin and put on homemade pizza like green pepperoni. You can use them in salsas, and I suppose that's what most people do, but since I quit eating chips I no longer make salsa. Sigh. 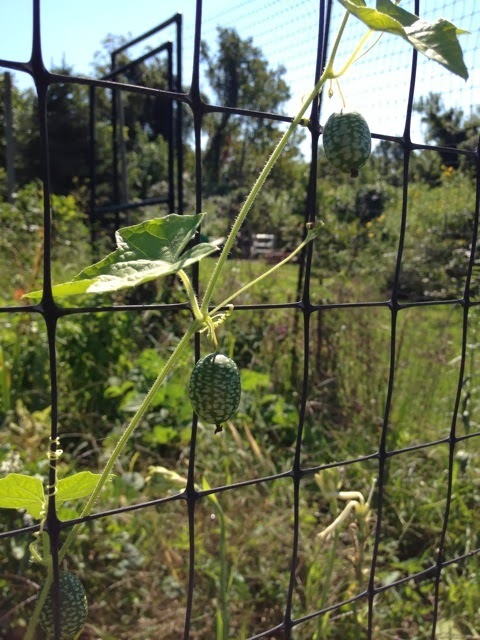 Another surprise find of the summer: the cucamelon, Melothria scabra. Native to Mexico, where it's called Sandiitas de raton or "mouse melon." Thought to have been cultivated long before colonial impact. It grows on a dainty little climbing vine with maple-shaped leaves. It tastes like a slightly limey cucumber, without a hint of sweetness, and has an impressive, nay, epic! crunch. Terrific on salads and in fresh salsas for texture, crunch and flavor. The vine takes no room at all--it just goes straight up, is tiny and delicate. You'd never think you'd get much off of it, so weak and spindly it is, but the yield is nice. 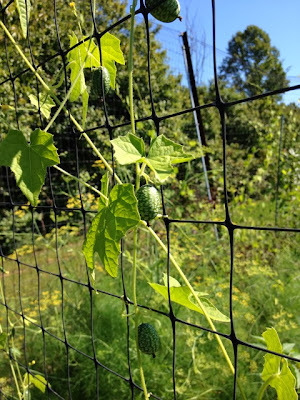 Cucamelons are not large. Grape-sized. Such fun to eat and give away. Probably the crunchiest thing I've ever grown, including sugar snap peas. And it would make a fabulous dollhouse watermelon. We call them Barbie watermelons around here. Because they're the perfect size to put in a Barbie doll's hands. I need to do that photo shoot. But I have no Barbie. Phoebe wrapped her Barbie completely up in toilet paper and buried her I know not where when she was about seven. She said she was making a Barbie mummy. Yeah. You go, girl. High use for a Barbie. So I've grown a few things I've never grown, and they were all winners. I like plants. I like experimenting with them. I like giving them to friends, sharing seeds, getting and giving recommendations and sharing the results. The other huge success were the orange and red sweet snack peppers I grew from seed. Just took seed from the little grocery store ones that come in Ziploc bags and started it in the greenhouse. Next spring I'll start it earlier--maybe in March, because my plants were festooned with fruit at frost. And they grew true to type!! There are almost no seeds in them and you can eat three or four before you can stop yourself. But why stop? High in vitamins A and C and a lot better for you than cookies. They're deliciously sweet and crispy, thick-walled and juicy. Highly recommended. Here's His Lordship Tim Appleton, MBE, exulting in the crunch of a sweet snack pepper while floating... temporarily... at North Bend. and of course I love my little darling Sungold tomatoes. I throw them in all my soups, chilis, quiches and stir-fries, too. The garden, she was very good to me this year. I loved every minute of harvesting and eating our own lettuce, Swiss chard, snap peas, beans, tomatoes, peppers, tomatillos and cucamelons. I'm already looking forward to starting next spring's seeds. I'm going to start those snack peppers, tomatillos, cucamelons and poblanos EARLY this time. And I'm going to figure out where those dang chard-eating bunnehs are getting in. Right. Really enjoyed this blog entry, Miss Julie. 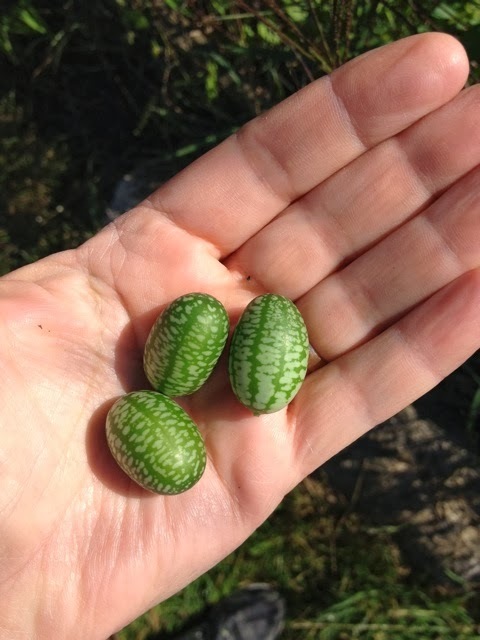 I noticed the mini-watermelons growing wild here in S Texas, wished I still had dolls/doll house! I never sampled them, but will next time we find some (they have not grown at all during drought years). I noticed that when ripe, they are a powerful laxative, so will skip the ripe, darkened ones! 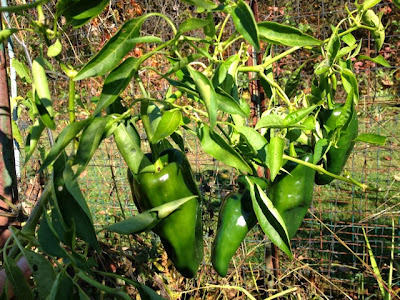 Love your poblanos, tomatillos, and colorful harvest. Here is a tomatillo song for you, to tune of "I'm a little teapot" - I'm a tomatillo, round and green! Please do not eat me, that would be mean. Sung while holding a fat tomatillo. We're back in Athens (briefly)and your post about poblanos etc makes my mouth water and my expectations for fresh veggies run amuk. While I love SE Ohio I am already looking forward to winter in Costa Rica... those veggies just can't be beat. Also... been meaning to report back that we love the "Rain Crows" CDs that we got while still in Texas... hope you let us all know when the next one is out. Love your posts as always, read every single one. Had a decent garden here this year, just got all the squash out before the massive Loveland Flood saturated the rest. The ducks and geese enjoyed it until we pulled it all out. Oh!n'hay! I LOVE X-infinity, the color of your house. Julie, Don't miss out on the salsas; just peel and thinly slice jicamas and use as a perfect dip/salsa "chip."